The Purloined Letter (1844) is a fine example of Poe's contribution to the genre of Dark Romanticism. Poe basically created the template for the detective story genre, emulated by the likes of Sir Arthur Conan Doyle. We feature it in Mystery Stories. At Paris, just after dark one gusty evening in the autumn of 18 -- , I was enjoying the twofold luxury of meditation and a meerschaum, in company with my friend, C. Auguste Dupin, in his little back library, or book-closet, au troisime, No. 33 Rue Dunt, Faubourg St. Germain. For one hour at least we had maintained a profound silence; while each, to any casual observer, might have seemed intently and exclusively occupied with the curling eddies of smoke that oppressed the atmosphere of the chamber. For myself, however, I was mentally discussing certain topics which had formed matter for conversation between us at an earlier period of the evening; I mean the affair of the Rue Morgue, and the mystery attending the murder of Marie Rogt. I looked upon it, therefore, as something of a coincidence, when the door of our apartment was thrown open and admitted our old acquaintance, Monsieur G -- -- , the Prefect of the Parisian police. "That is another one of your odd notions," said the Prefect, who had the fashion of calling everything "odd" that was beyond his comprehension, and thus lived amid an absolute legion of "oddities." "Very true," said Dupin, as he supplied his visitor with a pipe, and rolled toward him a comfortable chair. "And what is the difficulty now?" I asked. "Nothing more in the assassination way I hope?" "Oh, no; nothing of that nature. The fact is, the business is very simple indeed, and I make no doubt that we can manage it sufficiently well ourselves; but then I thought Dupin would like to hear the details of it because it is so excessively odd." "Why, yes; and not exactly that either. The fact is, we have all been a good deal puzzled because the affair is so simple, and yet baffles us altogether." "Ha! ha! ha! -- ha! ha! ha! -- ho! ho! ho!" roared our visitor, profoundly amused, "oh, Dupin, you will be the death of me yet!" "Why, I will tell you," replied the Prefect, as he gave a long, steady, and contemplative puff, and settled himself in his chair. "I will tell you in a few words; but, before I begin, let me caution you that this is an affair demanding the greatest secrecy, and that I should most probably lose the position I now hold, were it known that I confided it to any one." "Well, then; I have received personal information, from a very high quarter, that a certain document of the last importance has been purloined from the royal apartments. The individual who purloined it is known; that beyond a doubt; he was seen to take it. It is known, also, that it still remains in his possession." "It is clearly inferred," replied the Prefect, "from the nature of the document, and from the non-appearance of certain results which would at once arise from its passing out of the robber's possession -- that is to say, from his employing it as he must design in the end to employ it." "But this ascendancy," I interposed, "would depend upon the robber's knowledge of the loser's knowledge of the robber. Who would dare -- "
"The thief," said G., "is the Minister D -- -- , who dares all things, those unbecoming as well as those becoming a man. The method of the theft was not less ingenious than bold. The document in question -- a letter, to be frank -- had been received by the personage robbed while alone in the royal boudoir. During its perusal she was suddenly interrupted by the entrance of the other exalted personage from whom especially it was her wish to conceal it. After a hurried and vain endeavor to thrust it in a drawer, she was forced to place it, open it was, upon a table. The address, however, was uppermost, and, the contents thus unexposed, the letter escaped notice. At this juncture enters the Minister D -- -- . His lynx eye immediately perceives the paper, recognizes the handwriting of the address, observes the confusion of the personage addressed, and fathoms her secret. After some business transactions, hurried through in his ordinary manner, he produces a letter somewhat similar to the one in question, opens it, pretends to read it, and then places it in close juxtaposition to the other. Again he converses, for some fifteen minutes, upon the public affairs. At length, in taking leave, he takes also from the table the letter to which he has no claim. Its rightful owner saw, but, of course, dared not call attention to the act, in the presence of the third person who stood at her elbow. The minister decamped; leaving his own letter -- of no importance -- upon the table." "Here, then," said Dupin to me, "you have precisely what you demand to make the ascendancy complete -- the robber's knowledge of the loser's knowledge of the robber." "It is clear," said I, "as you observe, that the letter is still in the possession of the minister; since it is this possession, and not any employment of the letter, which bestows the power. With the employment the power departs." "True," said G.; "and upon this conviction I proceeded. My first care was to make a thorough search of the minister's hotel; and here my chief embarrassment lay in the necessity of searching without his knowledge. Beyond all things, I have been warned of the danger which would result from giving him reason to suspect our design." "Oh, yes; and for this reason I did not despair. The habits of the minister gave me, too, a great advantage. He is frequently absent from home all night. His servants are no means numerous. They sleep at a distance from their master's apartment, and, being chiefly Neapolitans, are readily made drunk. I have keys, as you know, with which I can open any chamber or cabinet in Paris. For three months a night has not passed, during the greater part of which I have not been engaged, personally, in ransacking the D -- -- Hotel. My honor is interested, and, to mention a great secret, the reward is enormous. So I did not abandon the search until I had become fully satisfied that the thief is a more astute man than myself. I fancy that I have investigated every nook and corner of the premises in which it is possible that the paper can be concealed." "This is barely possible," said Dupin. "The present peculiar condition of affairs at court, and especially of those intrigues in which D -- -- is known to be involved, would render the instant availability of the document -- its susceptibility of being produced at a moments notice -- a point of nearly equal importance with its possession." "Entirely," said the Prefect. "He has been twice waylaid, as if by footpads, and his person rigidly searched for my own inspection." "You might have spared yourself this trouble," said Dupin. "D -- -- , I presume, is not altogether a fool, and, if not, must have anticipated these waylayings, as a matter of course." "Not altogether a fool," said G., "but then he is a poet, which I take to be only one removed from a fool." "Why, the fact is, we took our time, and we searched everywhere. I have had long experience in these affairs. I took the entire building, room by room; devoting the nights of a whole week to each. We examined, first the furniture of each apartment. We opened every possible drawer; and I presume you know that, to a properly trained police-agent, such a thing as a 'secret' drawer is impossible. Any man is a dolt who permits a 'secret' drawer to escape him in a search of this kind. The thing is so plain. There is a certain amount of bulk -- of space -- to be accounted for in every cabinet. Then we have accurate rules. The fiftieth part of a line could not escape us. After the cabinets we took the chairs. The cushions we probed with the fine ling needles you have seen me employ. From the tables we removed the tops." "But you could not have removed -- you could not have taken to pieces all articles of furniture in which it would have been possible to make a deposit in the manner you mention. A letter may be compressed into a thin spiral roll, not differing much in shape or bulk from a large knitting-needle, and in this form it might be inserted into the rung of a chair, for example. You did not take to pieces all the chairs?" "Certainly not; but we did better -- we examined the rungs of every chair in the hotel, and, indeed, the jointings of every description of furniture, by the aid of a most powerful microscope. Had there been any traces of recent disturbance we should not have failed to detect it instantly. A single grain of gimlet-dust, for example, would have been as obvious as an apple. Any disorder in the gluing -- any unusual gap in the joints -- would have sufficed to insure detection." "I presume you looked to the mirrors, between the boards and the plates, and you probed the beds and the bedclothes, as well as the curtains and carpets." "We had; but the reward offered is prodigious." "You included the grounds about the houses?" "All the grounds are paved with brick. They give us comparatively little trouble. We examined the moss between the bricks, and found it undisturbed." "You looked among D -- -- 's papers, of course, and into the books of the library?" "Then," I said, "you have been making a miscalculation, and the letter is not upon the premises, as you suppose." "To make a thorough research of the premises." "That is absolutely needless," replied G -- -- . "I am not more sure that I breathe than I am that the letter is not at the hotel." "Oh, yes!" -- And here the Prefect, producing a memorandum-book, proceeded to read aloud a minute account of the internal, and especially of the external, appearance of the missing document. Soon after finishing the perusal of this description, he took his departure, more entirely depressed in spirits than I have ever known the good gentleman before. "Well, but G., what of the purloined letter? I presume you have at last made up your mind that there is no such thing as overreaching the Minister?" "Confound him, say I -- yes; I made the re-examination, however, as Dupin suggested -- but it was all labor lost, as I knew it would be." "Why, a very great deal -- a very liberal reward -- I don't like to say how much precisely; but one thing I will say, that I wouldn't mind giving my individual check for fifty thousand francs to any one who could obtain me that letter. The fact is, it is becoming of more and more importance every day; and the reward has been lately doubled. If it were trebled, however, I could do no more than I have done." "Why, yes," said Dupin, drawlingly, between the whiffs of his meerschaum, "I really -- think, G., you have not exerted yourself -- to the utmost in the matter. You might -- do a little more, I think, eh?" "How? -- in what way?" "Why -- puff, puff -- you might -- puff, puff -- employ counsel in the matter, eh? -- puff, puff, puff. Do you remember the story they tell of Abernethy?" I was astonished. The Prefect appeared absolutely thunder-stricken. For some minutes he remained speechless and motionless, looking incredulously at my friend with open mouth, and eyes that seemed startling from their sockets; then apparently recovering himself in some measure, he seized a pen, and after several pauses and vacant stares, finally filled up and signed a check for fifty thousand francs, and handed it across the table to Dupin. The latter examined it carefully and deposited it in his pocket-book; then, unlocking an escritoire, took thence a letter and gave it to the Prefect. This functionary grasped it in a perfect agony of joy, opened it with a trembling hand, cast a rapid glance at its contents, and then, scrambling and struggling to the door, rushed at length unceremoniously from the room and from the house, without having uttered a syllable since Dupin had requested him to fill up the check. "The Parisian police," he said, "are exceedingly able in their way. They are persevering, ingenious, cunning, and thoroughly versed in the knowledge which their duties seem chiefly to demand. Thus, when G -- -- detailed to us his mode of searching the premises at the Hotel D -- -- , I felt entire confidence in his having made a satisfactory investigation -- so far as his labors extended." I merely laughed -- but he seemed quite serious in all that he said. "The measures, then," he continued, "were good in their kind, and well executed; their defect lay in their being inapplicable to the case and to the man. A certain set of highly ingenious resources are, with the Prefect, a sort of Procrustean bed, to which he forcibly adapts his designs. But he perpetually errs by being too deep or too shallow for the matter in hand; and many a school-boy is a better reasoner than he. I knew one about eight years of age, whose success at guessing in the game of 'even and odd' attracted universal admiration. This game is simple, and is played with marbles. One player holds in his hand a number of these toys, and demands of another whether that number is even or odd. If the guess is right, the guesser wins one; if wrong, he loses one. The boy to whom I allude won all the marbles of the school. Of course he had some principle of guessing; and this lay in mere observation and admeasurement of the astuteness of his opponents. For example, an arrant simpleton is his opponent, and, holding up his closed hand, asks, 'Are they even or odd?' Our school-boy replies, 'Odd,' and loses; but upon the second trial he wins, for he then says to himself: 'The simpleton had them even upon the first trial, and his amount of cunning is just sufficient to make him have them odd upon the second; I will therefore guess odd'; -- he guesses odd and wins. Now, with a simpleton a degree above the first, he would have reasoned thus: 'This fellow finds that in the first instance I guessed odd, and, in the second, he will propose to himself, upon the first impulse, a simple variation from even to odd, as did the first simpleton; but then a second thought will suggest that this is too simple a variation, and finally he will decide upon putting it even as before. I will therefore guess even'; -- he guesses even, and wins. Now this mode of reasoning in the school-boy, whom his fellows termed 'lucky,' -- what, in its last analysis, is it?" "It is," said Dupin; "and, upon inquiring of the boy by what means he effected the thorough identification in which his success consisted, I received answer as follows: 'When I wish to find out how wise, or how stupid, or how good, or how wicked is any one, or what are his thoughts at the moment, I fashion the expression of my face, as accurately as possible, in accordance with the expression of his, and then wait to see what thoughts or sentiments arise in my mind or heart, as if to match or correspond with the expression.' This response of the school-boy lies at the bottom of all the spurious profundity which has been attributed to Rochefoucault, to La Bougive, to Machiavelli, and to Campanella." "And the identification," I said, "of the reasoner's intellect with that of his opponent, depends, if I understand you aright, upon the accuracy with which the opponent's intellect is admeasured." "For its practical value it depends upon this," replied Dupin; "and the Prefect and his cohort fail so frequently, first, by default of this identification, and, secondly, by ill-admeasurement, or rather through non-admeasurement, of the intellect with which they are engaged. They consider only their own ideas of ingenuity; and, in searching for any thing hidden, advert only to the modes in which they would have hidden it. They are right in this much -- that their own ingenuity is a faithful representative of that of the mass; but when the cunning of the individual felon is diverse in character from their own, the felon foils them, of course. This always happens when it is above their own, and very usually when it is below. They have no variation of principle in their investigations; at best, when urged by some unusual emergency -- by some extraordinary reward -- they extend or exaggerate their old modes of practice, without touching their principles. What, for example, in this case of D -- -- , has been done to vary the principle of action? What is all this boring, and probing, and sounding, and scrutinizing with the microscope, and dividing the surface of the building into registered square inches -- what is it all but an exaggeration of the application of the one principle or set of principles of search, which are based upon the one set of notions regarding human ingenuity, to which the Prefect, in the long routine of his duty, has been accustomed? Do you not see he has taken it for granted that all men proceed to conceal a letter, not exactly in a gimlet-hole bored in a chair-leg, but, at least, in some out-of-the-way hole or corner suggested by the same tenor of thought which would urge a man to secrete a letter in a gimlet-hole bored in a chair-leg? And do you not see also, that such recherchs nooks for concealment ar adapted only for ordinary occasions, and would be adopted by ordinary intellects; for, in all cases of concealment, a disposal of the article concealed -- a disposal in this recherch manner, -- is, in the very first instance, presumable and presumed; and thus its discovery depends, not at all upon the acumen, but altogether upon the mere care, patience, and determination of the seekers; and where the case is of importance -- or, what amounts to the same thing in the political eyes, when the reward is of magnitude, -- the qualities in question have never been known to fail. You will now understand what I mean in suggesting that, had the purloined letter been hidden anywhere within the limits of the Prefect's examination -- in other words, had the principle of its concealment been comprehended within the principles of the Prefect -- its discovery would have been a matter altogether beyond question. This functionary, however, has been thoroughly mystified; and the remote source of his defeat lies in the supposition that the Minister is a fool, because he has acquired renown as a poet. All fools are poets; this the Prefect feels; and he is merely guilty of a non distributio medii in thence inferring that all poets are fools." "You are mistaken; I know him well; he is both. As a poet and as a mathematician, he would reason well; as a mere mathematician, he could not have reasoned at all, and thus would have been at the mercy of the Prefect." "You surprise me," I said, "by these opinions, which have been contradicted by the voice of the world. You do not mean to set at naught the well-digested ideas of centuries. The mathematical reason has long been regarded as the reason par excellence." "'Il y a parier,'" replied Dupin, quoting from Chamfort, "'que toute ide publique, toute convention reue, est une sottise, cor elle a convenue au plus grand nombre.' The mathematicians, I grant you, have done their best to promulgate the popular error to which you allude, and which is none the less an error for its promulgation as truth. With an art worthy a better cause, for example, they have insinuated the term 'analysis' into application to algebra. The French are the originators of this particular deception; but if a term is of any importance -- if words derive any value from applicability -- then 'analysis' conveys 'algebra' about as much as, in Latin, 'ambitus' implies 'ambition,' 'religio' 'religion,' or 'homines honesti' a set of honorable men." "I dispute the availability, and thus the value, of that reason which is cultivated in any especial form other than the abstractly logical. I dispute, in particular, the reason educed by mathematical study. The mathematics are the science of form and quantity; mathematical reasoning is merely logic applied to observation upon form and quantity. The great error lies in supposing that even the truths of what is called pure algebra are abstract or general truths. And this error is so egregious that I am confounded at the universality with which it has been received. Mathematical axioms are not axioms of general truth. What is true of relation -- of form and quantity -- is often grossly false in regard to morals, for example. In this latter science it is very usually untrue that the aggregated parts are equal to the whole. In chemistry also the axiom fails. In the consideration of motive it fails; for two motives, each of a given value, have not, necessarily, a value when united, equal to the sum of their values apart. There are numerous other mathematical truths which are only truths within the limits of relation. But the mathematician argues from his finite truths, through habit, as if they were of an absolutely general applicability -- as the world indeed imagines them to be. Bryant, in his very learned 'Mythology,' mentions an analogous source of error, when he says that 'although the pagan fables are not believed, yet we forget ourselves continually, and make inferences from them as existing realities.' With the algebraists, however, who are pagans themselves, the 'pagan fables' are believed, and the inferences are made, not so much through lapse of memory as through an unaccountable addling of the brains. In short, I never yet encountered the mere mathematician who would be trusted out of equal roots, or one who did not clandestinely hold it as a point of his faith that x2 + px was absolutely and unconditionally equal to q. Say to one of these gentlemen, by way of experiment, if you please, that you believe occasions may occur when x2 + px is not altogether equal to q, and, having made him understand what you mean, get out of his reach as speedily as convenient, for beyond doubt, he will endeavor to knock you down. "I mean to say," continued Dupin, while I merely laughed at his last observations, "that if the Minister had been no more than a mathematician, the Prefect would have been under no necessity of giving me this check. I knew him, however, as both mathematician and poet, and my measures were adapted to his capacity, with reference to the circumstances by which he was surrounded. I knew him as a courtier, too, and as a bold intriguant. Such a man, I considered, could not fail to be aware of the ordinary political modes of action. He could not fail to be anticipate -- and events have proved he did not fail to anticipate -- the waylayings to which he was subjected. He must have foreseen, I reflected, the secret investigations of his premises. His frequent absences from home at night, which were hailed by the Prefect as certain aids to his success, I regarded only as ruses, to afford opportunity for thorough search to the police, and thus sooner to impress them with the conviction to which G -- -- , in fact, did finally arrive -- the conviction that the letter was not upon the premises. I felt, also, that the whole train of thought, which I was at some pains in detailing to you just now, concerning the invariable principle of political action in searches for articles concealed -- I felt that this whole train of thought would necessarily pass through the mind of the minister. It would imperatively lead him to despise all the ordinary nooks of concealment. He could not, I reflected, be so weak as not to see that the most intricate and remote recess of his hotel would be as open as his commonest closets to the eyes, to the probes, to the gimlets, and to the microscopes of the Prefect. I saw, in fine, that he would be driven, as a matter of course, to simplicity, if not deliberately induced to it as a matter of choice. You will remember, perhaps, how desperately the Prefect laughed when I suggested, upon our first interview, that it was just possible this mystery troubled him so much on account of its being so very self-evident." "There is a game of puzzles," he resumed, "which is played upon a map. One party playing requires another to find a given word -- the name of town, river, state, or empire -- any word, in short, upon the motley and perplexed surface of the chart. A novice in the game generally seeks to embarrass his opponents by giving them the most minutely lettered names; but the adept selects such words as stretch, in large characters, from one end of the chart to the other. These, like the over-largely lettered signs and placards of the street, escape observation by dint of being excessively obvious; and here the physical oversight is precisely analogous with the moral inapprehension by which the intellect suffers to pass unnoticed those considerations which are too obtrusively and too palpably self-evident. But this is a point, it appears, somewhat above or beneath the understanding of the Prefect. He never once thought it probable, or possible, that the minister had deposited the letter immediately beneath the nose of the whole world, by way of best preventing any portion of that world from perceiving it. "But the more I reflected upon the daring, dashing, and discriminating ingenuity of D -- -- ; upon the fact that the document must always have been at hand, if he intended to use it to good purpose; and upon the decisive evidence, obtained by the Prefect, that it was not hidden within the limits of that dignitary's ordinary search -- the more satisfied I became that, to conceal this letter, the minister had resorted to the comprehensive and sagacious expedient of not attempting to conceal it at all. "Full of these ideas, I prepared myself with a pair of green spectacles, and called one fine morning, quite by accident, at the Ministerial hotel. I found D -- -- at home, yawning, lounging, and dawdling, as usual, and pretending to be in the last extremity of ennui. He is, perhaps, the most really energetic human being now alive -- but that is only when nobody sees him. "At length my eyes, in going the circuit of the room, fell upon a trumpery filigree card-rack of pasteboard, that hung dangling by a dirty blue ribbon, from a little brass knob just beneath the middle of the mantelpiece. In this rack, which had three or four compartments, were five or six visiting cards and a solitary letter. The last was much soiled and crumpled. It was torn nearly in two, across the middle -- as if a design, in the first instance, to tear it entirely up as worthless, had been altered, or stayed, in the second. It had a large black seal, bearing the D -- -- cipher very conspicuously, and was addressed, in a diminutive female hand, to D -- -- , the minister, himself. It was thrust carelessly, and even, as it seemed, contemptuously, into one of the uppermost divisions of the rack. "No sooner had I glanced at this letter than I concluded it to be that of which I was in search. To be sure, it was, to all appearance, radically different from the one of which the Prefect had read to us so minute a description. Here the seal was large and black, with the D -- -- cipher; there it was small and read, with the ducal arms of the S -- -- family. Here, the address, to the minister, was diminutive and feminine; there the superscription, to a certain royal personage, was markedly bold and decided; the size alone formed a point of correspondence. But, then, the radicalness of these differences, which was excessive; the dirt; the soiled and torn condition of the paper, so inconsistent with the true methodical habits of D -- -- , and so suggestive of a design to delude the beholder into an idea of the worthlessness of the document; -- these things, together with the hyperobtrusive situation of this document, full in the view of every visitor, and thus exactly in accordance with the conclusions to which I had previously arrived; these things, I say, were strongly corroborative of suspicion, in one who came with the intention to suspect. "The next morning I called for the snuff-box, when we resumed, quite eagerly, the conversation of the preceding day. While thus engaged, however, a large report, as if of a pistol, was heard immediately beneath the windows of the hotel, and was succeeded by a series of fearful screams, and the shoutings of a terrified mod. D -- -- rushed to a casement, threw it open, and looked out. In the meantime I stepped to the card-rack, took the letter, put it in my pocket, and replaced it by a fac-simile, (so far as regards externals) which I had carefully prepared at my lodgings -- imitating the D -- -- cipher, very readily, by means of a seal formed of bread. "The disturbance in the street had been occasioned by the frantic behavior of a man with a musket. He had fired it among a crowd of women and children. It proved, however, to have been without ball, and the fellow was suffered to go his way as a lunatic or a drunkard. When he had gone, D -- -- came from the window, whither I had followed him immediately upon securing the object in view. Soon afterward I bade him farewell. The pretended lunatic was a man in my own pay." "D -- -- ," replied Dupin, "is a desperate man, and a man of nerve. His hotel, too, is not without attendants devoted to his interests. Had I made the wild attempt you suggest, I might never have left the Ministerial presence alive. The good people of Paris might have heard of me no more. But I had an object apart from these considerations. You know my political prepossessions. In this matter, I act as a partisan of the lady concerned. For eighteen months the Minister has had her in his power. She has now him in hers -- since, being unaware that the letter is not in his possession, he will proceed with his exactions as if it was. Thus will he inevitably commit himself, at once, to his political destruction. His downfall, too, will not be more precipitate than awkward. It is all very well to talk about the facilis descensus Averni; but in all kinds of climbing, as Catalani said of singing, it is far more easy to get up than to come down. In the present instance I have no sympathy -- at least no pity -- for him who descends. He is that monstrum horrendum, an unprincipled man of genius. I confess, however, that I should like very well to know the precise character of his thoughts, when, being defied by her whom the Prefect terms 'a certain personage,' he is reduced to opening the letter which I left for him in the card-rack." They are to be found in Crbillon's 'Atre.'" 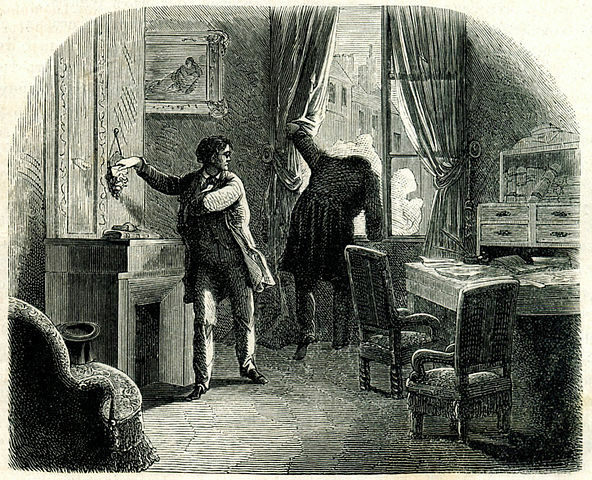 The Purloined Letter is the third of three detective stories featuring C. Auguste Dupin. If you enjoyed the story you may wish to read the other two: The Murders in the Rue Morgue and The Mystery of Marie Roget. Add The Purloined Letter to your own personal library.